Sad yet expected news came yesterday of the peaceful passing of the Right Honorable Baroness Thatcher of Kesteven, also known as the Iron Lady, both appellations being quite unlikely considering the standard British class structure that saw her beginnings as the daughter of a grocer. Born Margaret Hilda Roberts, she was osmotically nurtured in the atmosphere of politics by her father, active in the Methodist church and local politics as (ironically) a Liberal. An exemplary student, she studied on scholarship at Oxford, graduating in 1947 with a BS in Chemistry, but her extra-curricular focus was in politics, being the eventual president of the Oxford University Conservative Association. The process of abandoning all beliefs, principles, values, and policies in search of something in which no one believes, but to which no one objects; the process of avoiding the very issues that have to be solved, merely because you cannot get agreement on the way ahead. What great cause would have been fought and won under the banner: "I stand for consensus"? With the Conservative victory of Edward Heath in 1970, she became the Education Minister, and one of her enduring and fatuous legacies – and an indicator of how divisive her name continues to be – is that she abolished free milk for school children. In point of fact, it was actually her Labour predecessors who set that in motion, but that interferes with the media meme that she was parsimonious without regard to compassion. apparatchik. Though they stridently complain, notice that none of the critics pick up that option; i.e., If it is so important, then why don't you do it? 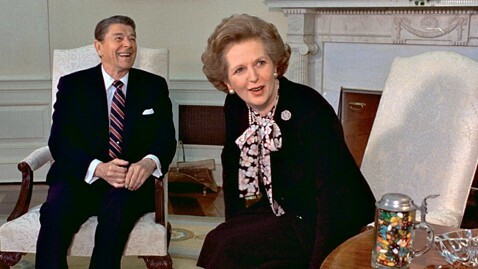 Heath's government and leadership of the Conservative Party collapsed in 1974, and Thatcher soon succeeded him in the party leadership. She honed her principles and her speaking voice but had no need to practice her candor. After denouncing the Soviet Politburo as being unconcerned about the ebb and flow of public opinion ("They put guns before butter, while we put just about everything before guns. "), the Soviet press labelled her as the Iron Lady. She was delighted to accept this accolade as an indicator of her determination, though I am sure that the Soviets actually meant to make a comparison to the medieval torture mechanism of the same name. 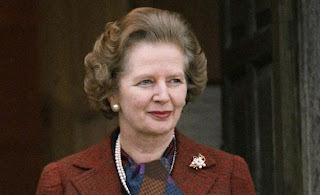 She became Prime Minister in 1979, the first woman to hold the position, and she was under no illusion as to the dire status of Britain at the time, which had picked up the sobriquet of "the sick man of Europe", taken from Turkey in the waning days of the decadent Ottoman Empire almost a century before. In addition to the desperate economic situation, inheriting the nationalized industries of the Labour Party and the enormous power wielded by union bosses and party officials (many of whom were unalloyed communists), she faced an insurrection from Irish terrorists focused supposedly on the status of British Northern Ireland. As she came to power, these terrorists killed the famous Lord Mountbatten and family members and friends when they blew up his fishing boat, and her friend and advisor Airey Neave, a hero of World War II and famous for escaping from Colditz, was killed when they detonated a car bomb right outside of Parliament. But I prefer to believe that certain lessons have been learnt from experience, that we are coming, slowly, painfully, to an autumn of understanding. And I hope that it will be followed by a winter of common sense. If it is not, we shall not be diverted from our course. To those waiting with bated breath for that favourite media catchphrase, the 'u-turn', I have only one thing to say: "You turn if you want to. The lady's not for turning." The audience erupted into loud, sustained applause for some five minutes. Besides her declared tenacity, I am sure that they delighted at her not-so-veiled reference to the popular post-war romantic comedy The Lady's Not For Burning, involving a woman unjustly accused of being a witch. She put the question of the Radical Left in perfect perspective with her observation that "the problem with Socialism is that eventually you run out of other peoples' money." Her intelligence and wit were always on display during the debates in the House of Commons, known for their erudition and sheer entertainment value. Her antipathy to socialism was also displayed in her scathing retort to a Labourite: "So what the right honorable member is saying is that he would rather the poor were poorer provided the rich were less rich." In 1984, she fortuitously escaped an assassination attempt by Irish terrorists, a bomb at a hotel that hosted the Conservative Party conference of that year. Five people were killed in the blast, but she went on the deliver her scheduled speech against the advice of her security staff, enhancing her steely public popularity. Her resolve was best evident after the invasion of the British-held and -populated Falkland and South Georgia islands by Argentina in 1982. She quickly composed a war cabinet and dispatched the Royal Navy and accompanying civilian ships (in a program of drafting such vessels delightfully named STUFT – Ships Taken Up From Trade) to take the islands back. The British did not have time to first come up with a war plan; they had to make it up as they went, and this from a military that had been organized exclusively, for budgetary reasons, to be an appendage of NATO in the event of a war in Europe. A major turning point in the lead-up to the landing of the Royal Marines, SAS and follow-on army forces to retake the islands was her order to sink the Argentine cruiser ARA General Belgrano by torpedo from the submarine HMS Conqueror, which removed any doubt as to the determination of the British. 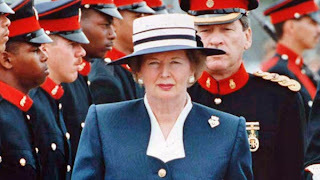 Despite the bashing from her critics that she took for giving the order, a post-war investigation of the conflict by the Argentine government – including the opinion of the captain of the Belgrano – admitted that the British were within their legal rights to attack and sink the ship. By a stroke of luck, she was in Washington when Saddam Hussein invaded Kuwait in 1990 and she conferred with President George H W Bush on a military intervention. When the ever-prudent elder Bush questioned some details of the developing plan, she famously bucked him up with "This is no time to go wobbly." The two together crafted the First Gulf War that liberated Kuwait, though she did not serve to see the end of the conflict as Prime Minister, resigning in an intra-party dispute in November 1990. Much has been written elsewhere, and for good reason, about her close association with Ronald Reagan and how the two were responsible for directly addressing the Soviet menace and ending it, when that communist empire dissolved “with a whimper” on Christmas of 1991. (To the group should be added the Polish Pope John Paul II, who quietly answered Stalin’s famous question about how many divisions the Pope had.) In some ways she was a mentor to Reagan, such as showing her resolve in the breaking of the mine workers' strike and likely reassuring his response to the air traffic controllers' strike shortly after coming into office. I will not pretend to add to the volumes of eulogies in that regard. 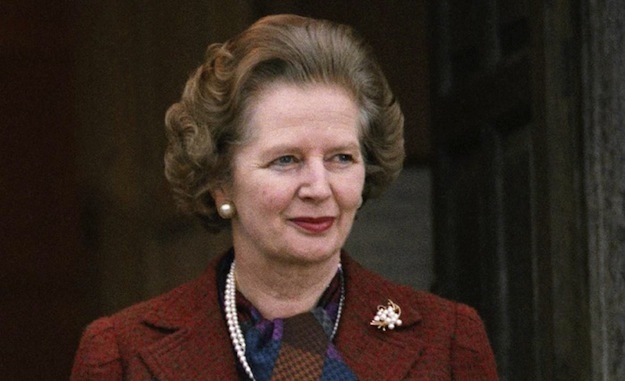 Despite her monumental accomplishment of bringing Britain back from the brink in the 1980s, she remains a divisive character on both sides of the political spectrum. She has been criticized by the Conservatives for leaving or grooming no real heir to her legacy, apparently having intimidated the party leadership by the sheer force of her personality, and instead they are left with the relatively feckless John Major and his successors. She once joked that her legacy was not so much that she solidified the Conservative Party but that she compelled the Labour Party, under Tony Blair, to lurch to the right. On the Left, hard to port as it is in that realm, Labour has had to caution its members against vilifying her memory beyond such examples of an already-rung bell as t-shirts and cups gleefully anticipating dancing on her grave, or some pronouncements such as from "Red' Ken Livingstone, former Mayor of London, who said that "almost everything that's wrong with Britain today is her legacy." Add the delegates at the National Union of Students who cheered at the news of Thatcher's death, and street celebrations in Belfast and Derry of Irish republicans and Sinn Féin. These are of a kind with the Left in America, who are comfortable with the idea that their respective nations are in decline, and should be. But whether it is communist union leaders or ossified conservative ones of their Establishment, they are uselessly bleating in their attempt to denigrate her. There is no denying that Baroness Thatcher was a monumental figure in her own right, and memory should remember her, as does PM David Cameron, as perhaps the greatest peacetime Prime Minister in British history. She will always be remember by many people around the world. 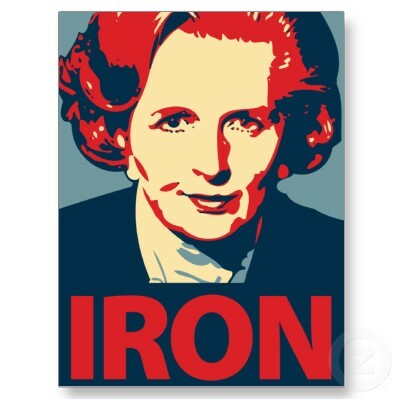 Margaret Thatcher was one of the most extraordinary and successful leaders in British history.